If you haven't already heard of or watched it, last night Rachel Maddow's show did a special episode on Dr. Tiller's murder. I was unable to watch it because of my lack of cable, but I definitely plan to locate it on the wonderful interwebs. 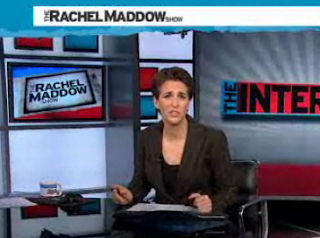 Here is a brief clip of Maddow interviewing Dr. Elizabeth Newhall. Maddow and Newhall discuss the "WANTED" ads created by anti-choice radicals that target abortion doctors and threaten their lives. I would like to thank Rachel Maddow for broaching a subject that most mainstream media just won't. Abortion providers are endangered. When I am in the clinic, particuarly if I'm alone, I am always very vigilant about making sure doors are locked and I check security cameras countless times a day. It's mad what we, abortion providers, have to do just to do our jobs and help others carry out their choices as they see fit. Thanks to our com mentors the link above will bring you to the whole episode or you can read commentary for multiple ways of viewing the episode! You can also download it for free on iTunes. Just search "Rachel Maddow" and you can find the whole thing. I feel like it could have been made longer and more in depth- like digging even further into how anti-choice groups/rhetoric is tied into the murder. It did emphasize that Roeder is not just some lone wolf, but I feel that they could have emphasized that point much more. I could see this being a two hour documentary, easily. I really loved the documentary, overall. "Tiller" was actually a trending topic on twitter for a little while because of it. I'd grab a box of tissues before watching it though, and I definitely don't plan on watching it right before bed again. The documentary was great. I really liked how they did a good job presenting such loaded material from such an unbiased perspective. They had really great interviews with people that were in some way involved in the assassination or with Dr. Tiller (I'm talking about directors of Operation Rescue or co-workers in Dr. Tiller's clinic, etc). As hard as it was for me to digest, my favorite part of the documentary were hearing what the people from Operation Rescue had to say (either about Dr. Tiller himself or abortions in general). I'm always trying to understand both sides of an issue/argument, but in this case it's hard to try to comprehend what the "other" side is articulating. Nonetheless, very enlightening and educational, and I plan on doing more research around Dr. Tiller, Operation Rescue and other things like that. I'm from Portugal, so I had to watch online. I didn't know exactly who Dr. Tiler was. I recognized the face from some blogs I've been into, but I didn't know the whole story. I knew he was an abortionist and that he was killed by anti-choice extremists, like so many others. The documentary made his story a lot less abstract though. "Women need abortions and I'm going to do them." He seemed like a fantastic human being. I get what ProChoiceGal says. It could have been looked into better, but the point was there, when the lady near the end says "They gather all these people up, they fill them with hate, and then they stand back when the least [sic] imbalanced among them does something, they stand back and say they didn't have anything to do with it." That's an accusation, even if it's not too elaborated, it says to the hate-spewing groups, it's on you too. I thought the most important part was their not absolving the non-violent antis. I had never thought about it before then, opting to consider most antis I encounter "harmless". But what Tiller's staff says is 100% correct: if you go around filling the world with hate, you can't hide in a corner when it spirals out of control. They didn't pull the trigger but they sure loaded the gun.